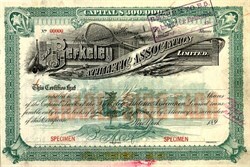 Beautiful engraved RARE specimen certificate from the Berkeley Athletic Association Limited printed in 1891. This historic document was printed by American Banknote Company and has an ornate border around it with a vignette of old athletic equipment including a tennis racket and an underprint of a dragon. This item is over 117 years old. The Berkeley Athletic Association, of No. 19 West Forty- fourth street, is a well-appointed club of smaller pretensions, but the Berkeley Oval has made it famous for out-of-door sports. The Berkeley Ladies' Athletic Club, of No. 23 West Forty-fourth street, has a membership of over three hundred. It has all the facilities of any gymnasium, including fencing, bowling, and swimming. Among the clubs that have athletic specialties may be named the Fencer's, at No. 8 West Twenty-eighth street; the Manhattan Bicycle, at No. 1790 Broadway; the Tennis, at No. 212 West Forty-first street; the Cricket, at No. 208 Third Avenue; and numerous others devoted to skating, bowling, and base-ball. WHITE MEN AND "ANTIS" SHARP CONTEST IN THE BERKELEY ATHLETIC ASSOCIATION. CULMINATION EXPECTED AT THE MEETING -- THE ISSUE WHETHER OR NOT THE OLD MANAGER SHALL BE REINSTATED -- FEARS THAT HE WOULD INCREASE THE DEBT. The prospects are that the annual meeting of the stockholders in the Berkeley Athletic Association, Limited, which is to be held in the Berkeley Lyceum, 19 and 21 West Forty-fourth Street, at 4:30 o clock to-morrow afternoon, will be a lively one. Some of the stockholders are already angry, others are likely to be before Friday morning. Proxies have been sent out galore by both faction a Into -which the association is split, and both sides aro electioneering Vigorously. The controversy is between Dr. John 8. White, the originator of the association, and at one time Its President, on tbe one hand, and numerous subscribers to his stock on the other. The Berkeley Athletic Association was. incorporated in 1887 -with a capital of 8100,000, which has since been increased by degrees to $197,500. Nominally, there were 1,000 shares; but as a matter of fact each subscriber had to take at least one block of five. The association built the Berkeley Lyceum, , was intended to provide a gymnasium Bud drill hall for the Berkeley School, of which Dr. "White was, and is still, the Head Master. An ^athletic club, founded on tho principles of temo and virtue, was started, and the In the association were granted free membership in it as one of their privileges. When the lyceum was built, it was mortgaged ,Sor 00,000. and when the Berkeley Ladies' Athletic Club was started and a. building put up .Tor-it at 23 West Forty-fourth Street, that was saddled with a fifteen-thousand-dollar 'mortgage. It was at this time that the $50,000 ,'of additional stock was issued. ! The Treasurer's report for the year ended j Dec. 31. 1891, showed a bad state . of affairs, i i There was found to bo a deficit in the treasury of' $29,OOO, which had been met in part by ^ the sale of stock, besides debts and disputed claims to the amount of over $6.,000, which ,wero not entered on the books for some reason 'or-other. The unpaid bills came to $15.000, and [as more than one suit to recover money was [then pending it was decided to settle up, and a 'second mortgage, covering both of the Forty.Xounh Street gymnasiums, was negotiated for 1315.00O in Apral. This makes the association s now foot UD $287.500. , On Feb. 12 last the men s athletic club held a meeting at which its condition *as talked over, ;andit was then evident that it must wind up its , its monay matters being badly snarled ,up. The club s existence has never been officially ended apparently, but on Feb. 20 It decided to give up tho light, the club left the Lyceum, and now has no home. It has not Iteld a meeting of any kind since last February. The confidence of tho stockholders in their manager had not been strengthened by the etate of affairs disclosed in the Treasurer's report for 1891, and at u lively meeting held on Slay 10 last they ousted Dr. White from the office of President and his men from the other p . and elected Directors to salt .themselves, putting William M. Martin in the President's chair. Dr. White and J. Clark Bead, Jiis right-hand man, who had been Secretary and Treasurer, wore retained in harmless positions on the board, apparently out of courtesy. o These doings startled the association aud discontent began to show itself. Tho new managers did their best to straighten matters out, and succeeded so well that it now loots as if the corporation would keep on its feet a while longer, anyway. On Xov. 28 tho Board of Directors issued a report, which really amounted to an - of the present condition of the association and the work of tbe last lot of officers. This has appeared in THE . Dr. White to have taken everything that has boon said and done as a personal attack on him. Aa soon as tSo Directors' report had been published Ur. White sent each of the a letter in which he said: ' have probably received this day. aa I have, from the present management of the Berkeley Athletic Association, a copy of a report embodying certain criticisms upon myself, passing any Judgment. I beg you to await the receipt of a statement from me which it will require a day or two to print, together -with a facsimile reprint of the original circular under vne terms ol which the stock was Eubecrioed; ibj a reprint of tho terms ol the lease as en;rro*seri in the ol toe association, a lull and complete tendered as long ago as Kept 7. Dy a committee of gentlemen consisting 9* Mr. John M. Bowers. Jlr. John T. Denny. llr. Hermann H. Mueller. and indorsed Dy 3ir. H. O. 3Tahn&, of which the present management has never taken any notice." .Dr. White's reply, which was dated Deo. JU amounted to a personal defense, and was fortified with numerous . It brought out the following letter from tho Board of Directors, addressed to stockholders: " It has como to the knowledge of the Board of Directors that Dr. John S. White has Issued a letter asking stockholders to reserve judgment on the report of the board until receipt of a proposed of explanation him, containing a letter signed "by Messrs. J. T. Dcuny. .!. 31. Howers, and H. H. Mueller. who examined into the made by the Board. &G. " With retard to the investigation made by the above-named gentlemen, the Kxecntivo Committee desire to say that they were in no senna a o committee,' but three personal friends of Dr. White, (stockholder^,) to ho took a statement of the claims , hici. which expressly ou ita face declared that it -was not a lull presentation. Tho ol tho association were placed at their service by request, but further than this the board was not balled on. The examination was purely on one side, tbe 'committee* apparently accepting Dr. White's statements without question. The spirit of the ' may bo somewhat irom the following statement iii ita lutter: 'Our Ion? association with you as at-, , or Directors in this association or its parent, the ^Berkeley Lyceum, led us to anticipate tho continued management, of this association In the interest ot jour school.' . "The board has no desire to argue Us case In circulars. It has placed before the stockholders in its report a plain statement of facts. Dr. White presented his explanations in fall to the members of the hoard, who uaa no except to ascertain the . and who by investigation had placed Bliemsolves in a position to judge intelligently. His Explanations failed entirely to satisfy the board that be had been acting in tho interest o! the stockholders. o "In conclusion, tho board foels that it would be a misfortune to intrust the management of the association again to its former President. Dr. White, and asks for the support of the stockholders. ' " Stockholders who expect to be present at the an. Jiual meeting are nevertheless requested to send .their proxies, to be used in case they are unable to attend. This is tho necessary for the reason that Dr. White, having been present at all the Divectors* meetings, and having tell knowledge of tha report, secured proxies through Messrs. J. oE. Denny and 3. If. Bo were prior to tho issuance ot ithe report, and therefore before its contents could ba known to the stockholders." I In a postscript IS was stated that proxies bad received from Kdward King, President . "Union Trust Company. F. P. Olcott, President Central Trust Company; George F. Baiter, President First National Bank; J. A. Garland, .Vice President First National Bank; Franols I. Stetson, Mr. Julian T. Da vies, Dr. Henry Tuofe, John P. Townsend, H. B. Hollins, and Q1/2n. Samuel Thomas. o A number of the stockholders were aeon yesterday, nd all to be getting wall up for Thursday's meeting. I* is expected that Dr. White will make strenuous efforts Co get the management of the association back Jnto his and his friends' hands. A prominent member of the " opposition" said yesterday afternoon: "JJot only will Dr. White not be President, but we ll leave him and his -law out of the management altogether this Jim a" Dr. White's "reply " was freely characterized as flimsy, and were falsehoods. The rumor that application would bo made for a receiver, which. uad been more or less current lately, was said to be untrue. The list of stockholders in the Berkeley Athletlo Association includes many owell-known names, among them Chauucey M. Depew, Joseph H_ Choate, William M. Bpaokman, Birdaevo Blakemaa, F. P. Olcott. H. W. Cannon, J. 8. "Warren, George E. Sullivan. Alfred L. Maplerre, Archer V. Pancoast, and Knford FrankUn. ______j_______ "Colnwitns 5n E"." The New-York Historical Society met last tight at Its rooms. Second Avenue and Eleventh Street. The paper of tho evening was read by Eugene Lawrence, tho writer ou historical subjects. It was very exhaustive, and was deVoted to the subject of " Columbus in Poetry," and touched on everything that had ever been concerning the navigator, into the casual allusions to tho ponderous and mistaken epics. A vote of thanks was passed in of tho favor conferred by the writer ii presenting tho result or his researches before the society. ____ __ --- *1T^ --o---- A KeporJ About Jr. JS:-yant. It was rumored about the Health Department J1/2 that Commissioner Joseph D. Bryant owas about to resign, ia order to accept an appointment from President-elect Cleveland. Dr. Bryant, who ia Grovor Cleveland's , was appointed by trim to the office o: Burgeon General of the State, a position he util "V)..8" Bryont said, however, that ho had nt present intention of resigning Ho refused tc oay about the rumored appointment. a lull and complete tendered as long ago as Kept 7. Dy a committee of gentlemen consisting 9* Mr. John M. Bowers. Jlr. John T. Denny. llr. Hermann H. Mueller. and indorsed Dy 3ir. H. O. 3Tahn&, of which the present management has never taken any notice." .Dr. White's reply, which was dated Deo. JU amounted to a personal defense, and was fortified with numerous . It brought out the following letter from tho Board of Directors, addressed to stockholders: " It has como to the knowledge of the Board of Directors that Dr. John S. White has Issued a letter asking stockholders to reserve judgment on the report of the board until receipt of a proposed of explanation him, containing a letter signed "by Messrs. J. T. Dcuny. .!. 31. Howers, and H. H. Mueller. who examined into the made by the Board. &G. " With retard to the investigation made by the above-named gentlemen, the Kxecntivo Committee desire to say that they were in no senna a o committee,' but three personal friends of Dr. White, (stockholder^,) to ho took a statement of the claims , hici. which expressly ou ita face declared that it -was not a lull presentation. Tho ol tho association were placed at their service by request, but further than this the board was not balled on. The examination was purely on one side, tbe 'committee* apparently accepting Dr. White's statements without question. The spirit of the ' may bo somewhat irom the following statement iii ita lutter: 'Our Ion? association with you as at-, , or Directors in this association or its parent, the ^Berkeley Lyceum, led us to anticipate tho continued management, of this association In the interest ot jour school.' . "The board has no desire to argue Us case In circulars. It has placed before the stockholders in its report a plain statement of facts. Dr. White presented his explanations in fall to the members of the hoard, who uaa no except to ascertain the . and who by investigation had placed Bliemsolves in a position to judge intelligently. His Explanations failed entirely to satisfy the board that be had been acting in tho interest o! the stockholders. o "In conclusion, tho board foels that it would be a misfortune to intrust the management of the association again to its former President. Dr. White, and asks for the support of the stockholders. ' " Stockholders who expect to be present at the an. Jiual meeting are nevertheless requested to send .their proxies, to be used in case they are unable to attend. This is tho necessary for the reason that Dr. White, having been present at all the Divectors* meetings, and having tell knowledge of tha report, secured proxies through Messrs. J. oE. Denny and 3. If. Bo were prior to tho issuance ot ithe report, and therefore before its contents could ba known to the stockholders." I In a postscript IS was stated that proxies bad received from Kdward King, President . "Union Trust Company. F. P. Olcott, President Central Trust Company; George F. Baiter, President First National Bank; J. A. Garland, .Vice President First National Bank; Franols I. Stetson, Mr. Julian T. Da vies, Dr. Henry Tuofe, John P. Townsend, H. B. Hollins, and Q1/2n. Samuel Thomas. o A number of the stockholders were aeon yesterday, nd all to be getting wall up for Thursday's meeting. I* is expected that Dr. White will make strenuous efforts Co get the management of the association back Jnto his and his friends' hands. A prominent member of the " opposition" said yesterday afternoon: "JJot only will Dr. White not be President, but we ll leave him and his -law out of the management altogether this Jim a" Dr. White's "reply " was freely characterized as flimsy, and were falsehoods. The rumor that application would bo made for a receiver, which. uad been more or less current lately, was said to be untrue. The list of stockholders in the Berkeley Athletlo Association includes many owell-known names, among them Chauucey M. Depew, Joseph H_ Choate, William M. Bpaokman, Birdaevo Blakemaa, F. P. Olcott. H. W. Cannon, J. 8. "Warren, George E. Sullivan. Alfred L. Maplerre, Archer V. Pancoast, and Knford FrankUn. ______j_______ "Colnwitns 5n E"." The New-York Historical Society met last tight at Its rooms. Second Avenue and Eleventh Street. The paper of tho evening was read by Eugene Lawrence, tho writer ou historical subjects. It was very exhaustive, and was deVoted to the subject of " Columbus in Poetry," and touched on everything that had ever been concerning the navigator, into the casual allusions to tho ponderous and mistaken epics. A vote of thanks was passed in of tho favor conferred by the writer ii presenting tho result or his researches before the society. ____ __ --- *1T^ --o---- A KeporJ About Jr. JS:-yant. It was rumored about the Health Department J1/2 that Commissioner Joseph D. Bryant owas about to resign, ia order to accept an appointment from President-elect Cleveland. Dr. Bryant, who ia Grovor Cleveland's , was appointed by trim to the office o: Burgeon General of the State, a position he util "V)..8" Bryont said, however, that ho had nt present intention of resigning Ho refused tc oay about the rumored appointment. HNP The prospects are that the annual meeting of the stockholders in the Berkeley Athletic Association, Limited, which is to be held in the Berkeley Lyceum, 19 and 21 West Forty-fourth Street, at 4:30 o'clock to-morrow afternoon, will be a lively one. Some of the stockholders are already angry, others are likely to be before Friday morning. The prospects are that the annual meeting of the stockholders in the Berkeley Athletic Association, Limited, which is to be held in the Berkeley Lyceum, 19 and 21 West Forty-fourth Street, at 4:30 o'clock to-morrow afternoon, will be a lively one. Some of the stockholders are already angry, others are likely to be before Friday morning. 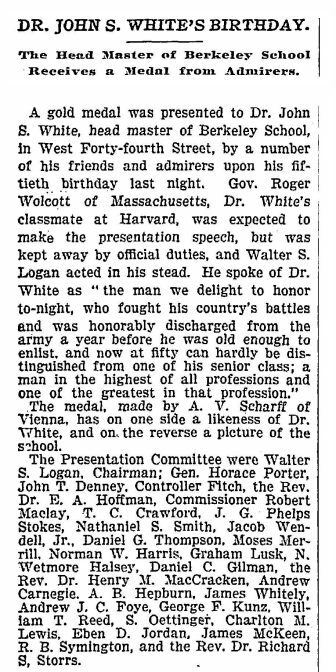 A gold medal was presented to Dr. John S. White, head master of Berkeley School, in West Forty-fourth Street, by a number of his friends and admirers upon his fiftieth birthday last night. Gov. Roger Wolcott of Massachusetts, Dr. White's classmate at Harvard, was expected to make the presentation speech, but was kept away by official duties, and Walter S. Logan acted in his stead. The Berkeley School. A DISTINGUISHED clergyman, writing his "Mind History" late ** in life, traced his first intellectual awakening to the advent of a new teacher in the little frontier school-house, where he laid the foundation of his future prominence in theology and exegesis. He was then a bright lad, full of the vigorous vitality which carried him to the end of his eighty-five years in unbroken health of mind and body. With muscles constantly yearning for exercise, he was restless tinder enforced confinement, especially where singing birds and murmuring streams constantly invited him to share the activities to which all his natural instincts were akin. Accordingly, he was classed among the bad boys of the school, and was a frequent victim of the school-master's practice of " walling ;" that is, taking a boy by the ears and butting his head against the logs which formed the sides of the ruder school building. One day a change came over the woodland school. The hard headed and hard-fisted school-master disappeared, and in his place came a soft-voiced woman, full of gentle sympathy with trials and temptations of youth. Instead of confining them for hours together upon the hard school benches, doling out to them dull tasks, she would startle the children by calling out, in a cheery voice : "Scholars, attention ! Now let us see who can get up first onto the bench !" Then she would march her thoroughly aroused pupils around the school-house and standing them in line, start a competitive examination in spelling. In such ways as this the routine of the school was varied,and interest excited where apathy prevailed before. Our bad boy received the mental stimulus to which his future success was traceable. From being accounted one of the dullest, he soon established a reputation as the brightest boy of school. Admiral Farragut, who was born in the same year as the clergyman referred to (1801), once spoke to the writer with great satisfaction of a similar experience when he was a midshipman at school in Chester, Penn., in 1814-15. His teacher, a convert to the system of Pestalozzi, was accustomed to relieve the tedium of school life in those days by taking the boys to wander in the fields, instructing them by the way, as the Master did his disciples. These ideas have probably reached their fullest development in the modern educational system of which we have an illustration in the Berkeley School of New York City, under the Head-Mastership of John S. White, LL. D. Here everything is directed to the harmonious development of mind and body in unison ; to the awakening of intellectual activity as well as to the accumulation of knowledge. There are no dull hours in the "Berkeley," no fool's caps, no dunces' benches. Its pupils, instead of playin T truant, eagerly seek their desks and find de- light in fulfilling their varied duties. The modern ideas of perfect ventilation for school rooms, systematic physical exercise and military drill for producing "well set-up" men, find expression here also in theory and practice. Dr. White is a product of the Boston schools. Born in Wrentham, Mass., of the old Puritan stock, he took first medals in the Chapman Grammar, English High, and Latin Schools of Boston, and was graduated at Harvard in 1870, with the highest Classical Honors. After ten years of most successful work, four as Master in the Boston Latin School and six as Head-Master of the Brooks Academy, Cleveland, Ohio, he resigned the latter post in 1880 to found the Berkeley School in New York. In 1879, he was made a Doctor of Laws by Trinity College, has been elected a fellow of several foreign societies, and has obtained considerable reputation as a writer. But it is as a teacher and manager of boys, with a patient and stimulating influence for good over them, that he is best known. A warm friend of Dr. White�President Oilman of Johns Hopkins University in Baltimore, Md., named the new school "The Berkeley" in honor of George Berkeley, Bishop of Cloyne�well-known as the greatest benefactor of early education in America. The school was opened in the autumn of 1880, at 252 Madison Avenue. Accommodations were provided for sixty boys the first year, for ninety the second, for one hundred and twenty the third, and for one hundred and fifty the fourth. The applications for admission to the school exceeded the limit in each instance and the names of candidates came to be registered for entrance years in advance. April, 1874, found the school comfortably housed in the new building with large three-story extension, at 6 East 44th St. In 1887, the gymnasium of the Berkeley Athletic Association was erected at 19 and 21 West 44th St., of which the school has the privileges in the afternoon, and the following spring brought the welcome addition of ten acres of playgrounds at Morris Dock�now known as the Berkeley Oval � together with the boat-house upon Harlem River, at a distance from 44th St. of only seventeen minutes' ride by rail. The Oval is the property of the school, but its privileges are shared by the Berkeley Athletic Association. The success of the school has been greatly advanced by the selection of a corps of masters of the highest scholarship, experience and fitness to teach, as a result of which the uniform success of the graduates of the school in entering the leading colleges, and their subsequent high rank, has been remarkable. The provision upon a generous scale of facilities for physical training and exercise, under intelligent supervision, has produced a school of robust boys, in which illness is a rare occurrence. The new building of the Berkeley School, of which the illustrations give an excellent representation, occupies four city lots, numbered 18, 20, 22 and 24 West 44th St. The aim of the architects has been to design an absolutely fire-proof building, with a classical exterior in the Ionic order of architecture, and at the same time to secure as much light as possible for the school and class-rooms. An interesting feature of the ornamentation is the wide frieze supported by the central columns in the third story. It is a section of that wonder of Phidian art, the freize of the Parthenon at Athens. Through the courtesy of General di Cesnola, of the Metropolitan Museum of Art, who allowed the models to be used, and the Perth Am boy Terra Cotta Co., who have taken great interest in the work, selections of the frieze that once ornamented the old Athenian temple on the north side have been accurately reproduced and united in such a way as to form a harmonious band forty feet in length and containing a part of the pro- cession of warriors on horseback on their way to the sacrificial offering. Often three or four horses dash abreast in unruly beauty, the flowing draperies forming models that have ever been the envy of artists. The materials used in the building are Indiana lime stone and warm yellow "Roman " brick and terra cotta. The entire framework is of a most substantial iron construction, and the interior walls, the floors and the roofs are built entirely of iron and fire-proof brick. The main building measures 100 feet on the street by forty-seven in depth and is four and a half stories in height above the basement. The remainder of the plot of land is covered in full by an armory one and a half stories high, with a monitor roof of glass and iron�a single span 53 by 100 feet�and the rear wall of the school building is supported upon the ground floor by two iron columns and immense girders for the purpose of allowing the drill-room to extend beneath, affording a floor space of nearly 9000 square feet. On the front are the coat-rooms, equipped with individual lockers, and a cellar extends beneath. The first floor contains the reception-room, library or graduates' room, the rooms of the Head-Master and Registrar and the dining and lunch rooms. Upon the second and third floors are eight large schoolrooms, each having a separate'recitation room, thus giving facilities for hearing recitations in small divisions. The dormitories afford accommodations for two masters, the lady resident and the sixteen boarding students, all the rooms being single except two. There is also a physical laboratory lighted by a dome from above, and equipped with tables, gas and water for experimental work. In the separate west wing of the upper floor are the laundry and servants' rooms. The Boynton system of heating by hot water has been adopted as being by far the most perfect method yet devised for this purpose, the fresh air being taken into the rooms at numerous places upon each floor and an original system of artificial ventilation by motive power has been introduced by means of which the air is completely changed three times an hour through ample flues connecting with every room. The plumbing conforms to the best approved methods ; the marble and fittings are rich and attractive. The pipes are exposed and carried from cellar to roof in the separate shaft which contains the toilet rooms. All the toilet and bath-rooms have outside windows. The school-rooms are furnished with "single" desks of quartered oak designed especially for the school after careful experiments made from a hygienic standpoint. The desks are placed in single rows with aisles upon both sides receiving the light from the left hand in every case, and the chairs afford a genuine novelty in school furniture in point of comfort and attractiveness�the chair seat being upholstered in leather. An interesting feature of the new school, tending to give to it a character of dignity and permanence, is the decoration of the great hall and the adjacent rooms upon the first floor with four stained windows, designed by Louis Tiffany in memory of students who died while mem bers of the school. WM. C. CHURCH.